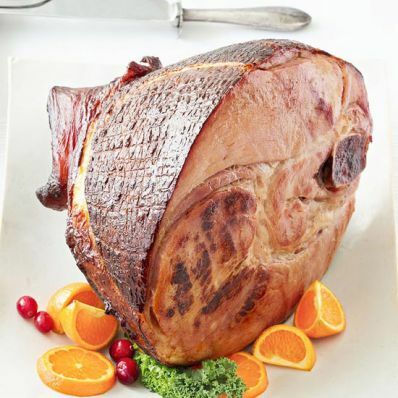 1 of 3 Heat oven to 325 degrees F. Unwrap ham and place flat-side down on a rack in a shallow baking pan. Cover with foil and bake at 325 degrees F for 2 hours. 2 of 3 Meanwhile, combine marmalade, orange juice, cranberry sauce, mustard, ginger and cloves in a small saucepan. Cook over medium-low heat until cranberry sauce has melted and mixture is smooth, about 5 minutes. 3 of 3 Uncover ham and turn upright. Brush about 1/3 of the glaze over ham. Return to oven, uncovered, and bake at 325 degrees F for 30 minutes more, brushing with glaze once more during bake time. Serve with remaining glaze alongside.